The wildflowers included in this list are recognized as "hummingbird friendly," meaning that they either provide nectar or attract the insects that are critical to hummingbirds when they are nesting. It is also important to plant flowers, shrubs & trees that bloom over a long period of time. 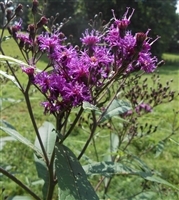 Plant has sword like leaves and large blue-violet flowers 1-3cm across and helps deter erosion in low areas. Best grown in consistently moist organic soils. Good candidate for a rain garden. Truly stunning carmine flowers borne on tall slender spikes which rise from a basal rosette of leaves. Ideal for use in hummingbird and rain gardens. Grown from Kentucky-source seed. 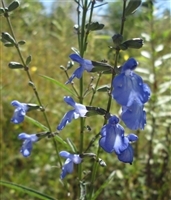 Spikes of tubular blue-violet flowers attract and support bumblebees. 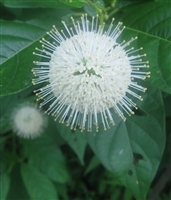 This plant works well in a rain garden, along a waterway or at the edge of a pond. Grown from Kentucky-source seed. Showy pagoda-like white to deep pink bracts form a ring below less conspicuous spotted yellow flowers. 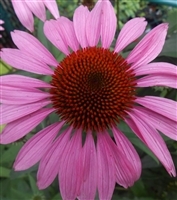 Low maintenance, long-lasting bloom period, though a 'weak perennial.' We have mixed results with it over-wintering. A pollinator favorite. Larval host for the Gray Marvel moth. 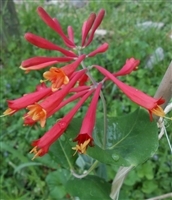 Brilliant red flowers are a hit with hummingbirds. Foliage emits spicy odor when crushed. Striking as a cut flower. 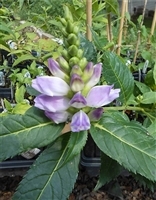 Pairs of true blue flowers arranged on thin flowering stalks catch the eye even from a distance. Foliage is nicely aromatic when crushed. May be trimmed back in late spring to desired height and shape. Attracts bees and butterflies & is deer resistant. 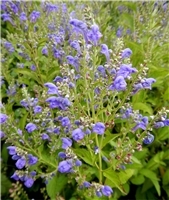 Blue flowers are conspicuous and attractive, a most pleasing accent plant. Primarily pollinated by bumblebees. Grown from Kentucky-source seed. Tall wispy, white candelabra-like flowers attract a multitude of pollinators and produce an especially strong effect when a number are planted together in a group. Candidate for rain gardens. Perfect for a sunny border, the tubular flowers are white or tinged with pink and attract a variety of native bees & hummingbirds. Foliage is a smooth, glossy dark green. Also known as Bee Balm, this is a wonderful plant for a pollinator garden. 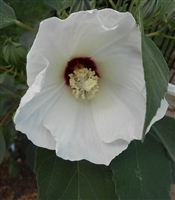 It attracts hummingbirds and butterflies and has a long bloom period. Excellent hummingbird plant with red flowers to 2" across. Makes a lovely addition to a pollinator garden.